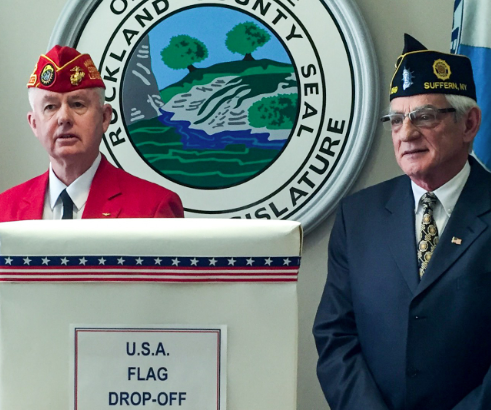 The County Legislature, Patrick Casper, commander of the Fromm-Maxwell-Debaun American Legion Post 859 in Suffern and John Leighton, past commandant of Rockland Detachment 243 of the Marine Corps League this week announced a new effort that will provide the public with a convenient location to drop off old, worn or tattered US flags. The collection effort will provide visitors to county government offices, as well as county workers and anyone else who wants to stop by, with a convenient drop-off location for their worn U.S. flags. U.S. Marine Staff Sgt. Lindsay of the Marine Recruiting Office in Nanuet was consulted as part of the planning process for the new collection effort. Commander Casper said the collection would help people who don’t know what to do with their old flags. The Suffern American Legion Post annually receives about 800 worn U.S. flags, which are properly retired in time for Flag Day, which falls on June 14. Commander Leighton also encouraged people to take advantage of the collection effort. Collected flags will be hand-delivered to Post 859 for proper disposal during a June 11 retirement ceremony. Flags may be dropped off between 9 a.m. and 5 p.m. weekdays through June 9 at the Legislature’s Offices, 11 New Hempstead Road in New City. Call 845-638-5100 for more information.